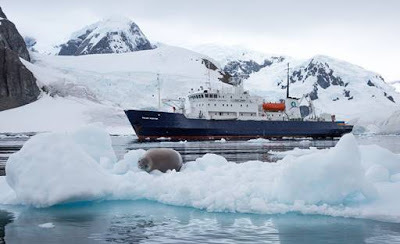 Aurora Expeditions, Australia's leading expedition cruising company, has announced the farewell season for its beloved expedition vessel the Polar Pioneer – which is set to make its final voyage in the 2018/19 Antarctic and the 2019 Arctic season. The announcement comes as Aurora Expeditions prepares to enter a new chapter in its proud history with the launch of the new world-class expedition ship 'Greg Mortimer' and its inaugural 2019/2020 polar season. Originally built as an ice-strengthened research vessel in Finland in 1982, the small and nimble Polar Pioneer was refurbished in 2000 and converted into a passenger ship for expeditions to the polar regions. Since then, the 54-passenger ship has been instrumental in pioneering small group expedition travel to the heart of nature for thousands likeminded expeditioners. Polar Pioneer has been a home away from home for Aurora's expedition team for many years, and of course the heart and soul of every expedition. A warm, safe, welcoming environment and refuge for expeditioners, the ship has also been the place where lifelong friendships have been forged, and even the occasional proposal! "For more than 25 years we've been driven by the passion to explore, and we've always chosen the best ships to do so. We are excited for our future and the launch of Greg Mortimer which, with its patented Ulstein X-Bow allowing for smoother, faster and more environmentally friendly sailings has been purpose built for adventure, and will redefine expedition cruising while continuing to provide the authentic, small group adventures that we are known for. "However, we will never forget our humble origins, as it is those early days of audacious pioneering, of pushing the boundaries and taking expeditioners just a little outside their comfort zone that made Aurora Expeditions what it is today," he continued. Halfpenny encourages travellers to get in quick as the final season for Polar Pioneer is expected to sell out fast. For a limited time, travellers can save up to $3,000 per person when booking on Polar Pioneer's 2018/19 Antarctica or 2019 Arctic & 2019 Scotland departures.